A pale premium lager from Czech Republic. Universally regarded as one of the world's great lager conditioned beers, we only use the finest ingredients, first-class cones from locally grown Saaz hops, natural soft water from ice age lakes and carefully selected grains of a unique strain of the Moravian barley make our Budweiser Budvar non alcoholic a truly great beer. 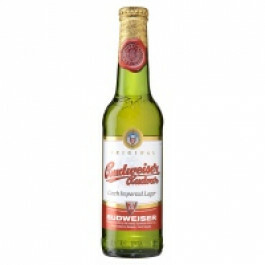 A pale premium lager from Czech Republic. Universally regarded as one of the world's great lager conditioned beers, we only use the finest ingredients, first-class cones from locally grown Saaz hops, natural soft water from ice age lakes and carefully selected grains of a unique strain of the Moravian barley make our Budweiser Budvar non alcoholic a truly great beer.